I read Ray Buckley’s book with great interest. 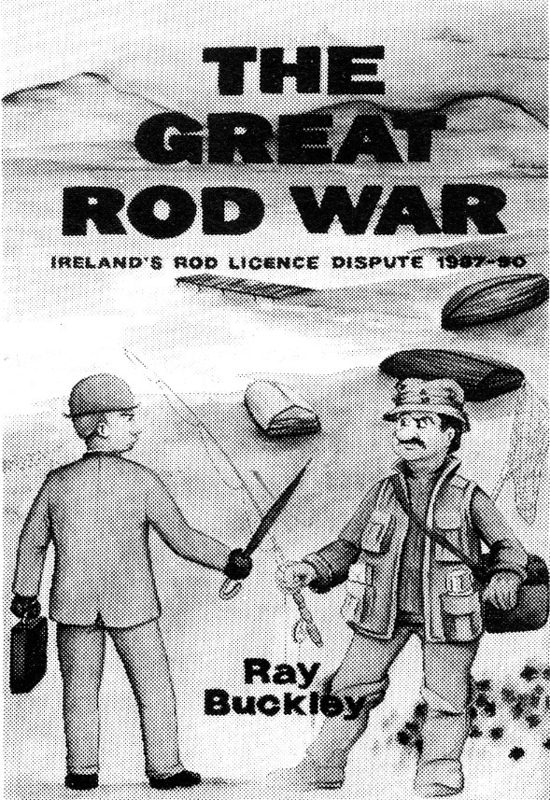 It is a well written, packed with detail account of the rod licence dispute, by one of the main anti-rod licence campaigners and negotiators at both local (Cong) and national levels. It tells the story well and in some detail albeit from a broad perspective with some local colour. Because of this it may disappoint those who expected more local detail and colour. The pivotal role of Oughterard and of the Oughterard angles and Oughterard and Collinamuck boatmen does not, I believe, receive sufficient attention. After all, it was on the proposal of the Oughterard Club, represented by Joe Lydon, Frank Kyne, Joe Maguire,(Chairman), and myself, that the Corrib Federation of Angling Clubs, at its meeting in Cornamona, adopted a policy to support (in any order) M. D. Higgins (Lab. ), Fintan Coogan (F.G.), Padraic Mc Cormack (F.G.), Jimmy Brick (W.P.) and Bobby Molloy (P.D.) at the general Election. 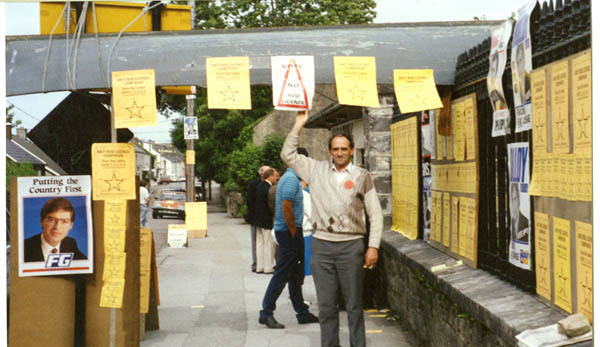 This policy was actively pursued by all Corrib Clubs using posterage, house-to-house canvasses, public meetings and church gate rallies with considerable success. At a different level, the whole scale prosecution of up to a 100 anglers and boatmen from the Oughterard area including four (Frank Kyne, Gerry Lambert, Steven Tierney and Joe Crane) who were and still are under injunction, attested to the strength of the Oughterard opposition. Of course, no account can supply all the details but some of the Oughterard story remains to be told and many unsung local heroes deserve a written record of their contribution. Objectively, Buckley is very good on the national politicians involved and on the newspaper, radio and T.V. coverage provided by many commentators. Most commentators are given a fair crack of the whip, with one notable exception – Mr Stephen Ryan, of the “Sunday Tribune”, who is not mentioned at all!. This is most unfair. Mr Ryan played a notable part, particularly with reference to his participating against the Oughterard boycott for which he will always be remembered albeit with little pleasure in Oughterard. During the three year campaign many politicians and commentators attempted to demonise the anti-rod licence campaign by referring to them as “thugs”, “bullies”, subversives” ,”involved in criminal activity”, “law breakers”, etc. They failed. On the other hand some of the anti-rod licence campaigners were not slow to respond, sometimes at that level, “SCAB” and other signs, mostly inoffensive, were commonplace. Surprisingly, Buckley does not refer to the lack of activity of local councillors in Galway and Mayo, who did not represent their Corrib, Mask and Carra communities as well. By contrast, the priests of the local communities and the bishops involved, Bishop Eamon Casey and Archbishop Joe Cassidy, come out of this account with flying colours. They, like the Gardai were in touch with their local communities and knew the depth of feeling theirin. The politicians, who should, did not! Finally, the book details a dispute which should never have arisen. It demonstrates the importance of good local representation at all levels, political and otherwise. If politicians (local and national) had known their communities, if Fishery Boards and angling bodies had been properly representative, then the rod licence legislation would not have arisen and our local community in Oughterard would be a better and happier place. The book is a must for those interested in learning how to ensure that, in the future, this is so. This page was added on 27/07/2011. We should use this stance as an example of how when a community stands firm they will over come. The property tax is a new agenda where the tactics in the rod license could be adapted.